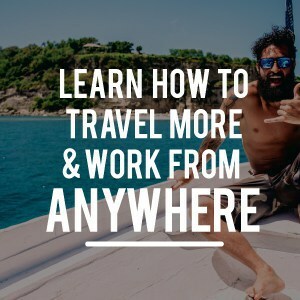 Recently, on the Desk to Dirtbag Facebook page, Anna wrote in about how she is going to make the leap to a nomadic lifestyle and wants to do a simple truck camping setup. She asked what my main recommendations are for those considering purchasing a truck canopy for camping. I’ve been wanting to do more videos for YouTube and figured this was a perfect opportunity to answer one of your questions! If you’ve got a question, shoot me an email! I’ve been using my truck canopy for camping for literally hundreds of nights, at least, over the past couple years. And I love passing on my knowledge and experience to you all. 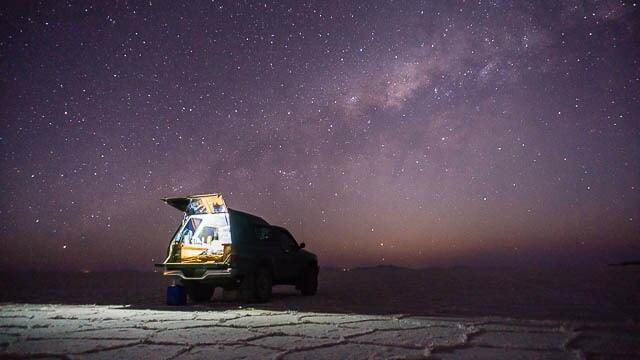 So, check out the video above, and if you have questions about truck camping, please don’t hesitate to sound off in the comments below or email and ryan@desktodirtbag.com and I will try to get back to you–and maybe even use your question as a future video. Try to find a canopy that offers a few inches extra headroom over the cab of your truck. The extra space when you are sitting in back, changing clothes, moving things around, etc, is absolutely invaluable. I purchased the Leer 122 model specifically because of the extra headroom. The extra headroom is even more crucial if you are going to build a traditional style elevated sleeping platform (ie with gear storage underneath). But I would highly recommend you try the back shelf or transformer style approach that I ended up using. 1) the carpeted headliner helps absorb the moisture and condensation that is bound to accumulate throughout the night. You don’t want drips falling on your face as you sleep. 2) You can easily velcro things to the head liner to attach lights, clips, etc. You can buy velcro tape from just about anywhere and use one half of it to stick things to your headliner. Constantly taking off and sticking on velcro things can be hard on your headliner, so I just leave the clips and things in place, knowing that I *can* move them if and when I want to, I do not take them down on a regular basis. The lights I use in the back, in fact, have two attachment points, a magnetic base plate which I velcro’ed to the ceiling, and the light itself (which attaches via the magnet) which I can easily take and off as I see fit. There is a dilemma here in choosing your side windows, or at least among the options available when I purchased mine. 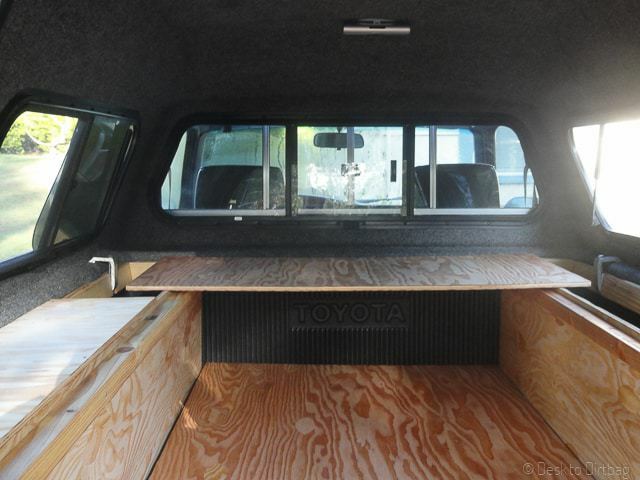 You can either get the windoors which outward, which are by far more convenient for gear access and packing your truck. Or you can get a screened window which doesn’t open at all but might be your only ventilation point at night if you are in a buggy area. The best option would be a windoor which also has a small screened section, which I know do exist (I’ve seen them on some truck canopies–but it wasn’t an option when I bought mine). That being said, I went with one screened window and one windoor. It is a compromise, and sometimes I do wish I had two windoors. I still go back and forth about whether I should have gotten the other one or not. With my setup, I put the items I rarely need during the daytime or only need at night in that back corner by the screened window (otherwise I have to crawl over gear to get to it). And put items I am more likely to need or want during the day near the windoor. Definitely be sure to get the cigarette lighter adapter ports hooked up in the back of the canopy (connected to your battery in the engine) which allows you to charge and run electronics at night from the back while you are sleeping. You don’t want your sole power source to be the cigarette lighter in the cab while you are sleeping in the back with a dying cell phone. 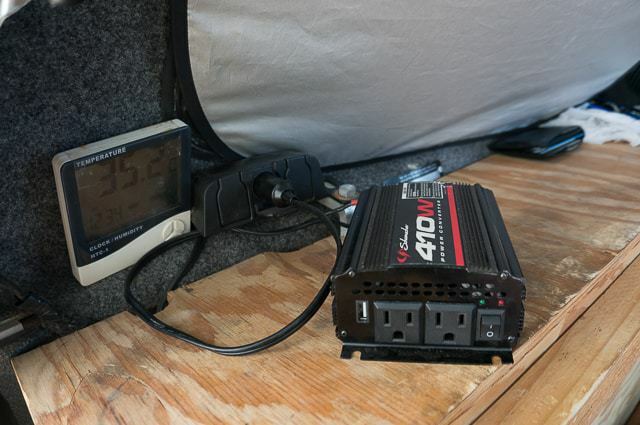 With the cigarette lighter adapter you can purchase a simple 400W power inverter to convert the 12v current into a standard household power source that you can plug in laptops and electronics. It’s for that reason that many people install a dual battery setup with isolator. I FINALLY did this recently and it has made a huge difference and has allowed me to relax about keeping all my gear charged. Previously I would charge my cameras, phone, laptop, etc during the daytime with my truck off, but would idle my truck ever hour or so to ensure I keep a sufficient charge. I would NEVER charge anything overnight for fear of a dead battery. Now, with a dual battery and isolator I can charge whatever I want worry free overnight and never have to worry about a dead battery. 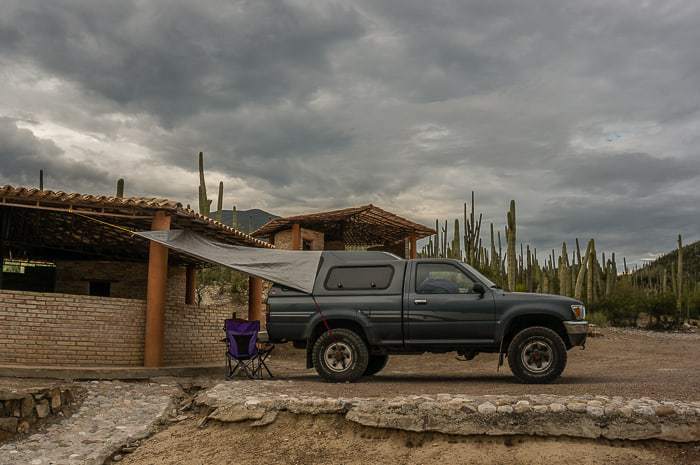 Four things I would definitely recommend you consider and get when selecting a canopy for truck camping: 1) elevated headroom in your canopy, 2) carpeted headliner for condensation and velcro, 3) screened windoors if possible, 4) power availability in the back. 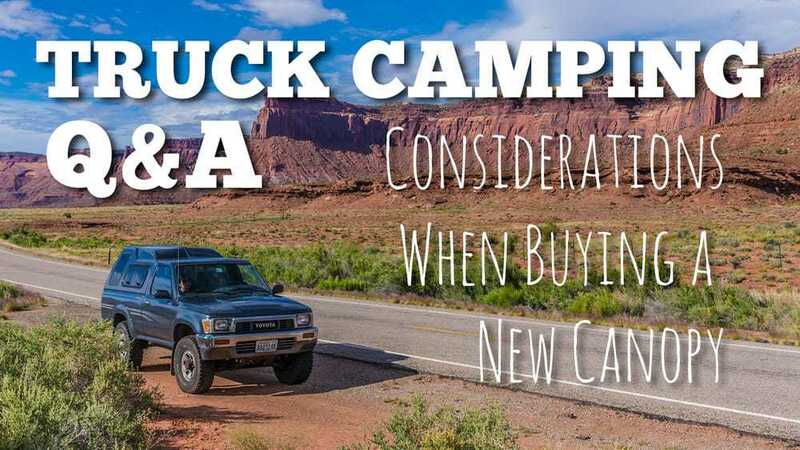 I hope that helps, and again, if you have any questions about truck camping, let’s hear them! Your blog is so inspiring and really adds fuel to my burning desire for adventure. I’m in a bit of a unique situation and I think that you, in fact, are uniquely qualified to give your insight. 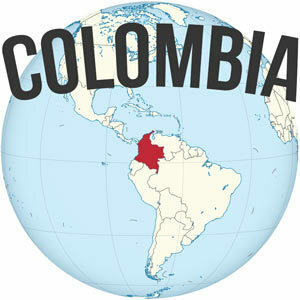 Backstory: Since 19 (I’m 25 now), I’ve been accustomed to a lifestyle of travel and adventure. After 17 countries (4 this year) and spending the past 12 months out of two backpacks, I’ve come to my first situation of “settling down”. Basically, I’ve found a work position based in Tampa, FL (super hot and humid) and will be relocating there shortly. To keep my sense of adventure, and save on rent, I’m actually looking to live 100% out of the bed of a pickup truck. I can shower at the gym and am resourcesful enough to cover my basic human needs. I also like to be social, so I’ll only come home at night to sleep and work on my laptop. You mentioned that heat can wear on you. For someplace hot and humid, like Florida, is there anything better than a small fan to keep the inside cool and dry? Do they make small dehumidifiers or truck mini-A/Cs? I don’t have a truck yet. Do you have a recommendation for an inexpensive (reference: CHEEEAAAP) and reliable truck? I’m only 5’8” and 160lbs, so I don’t need much space. I’ll also be driving the vehicle to work everyday, but I can park near a gym that’s near work. 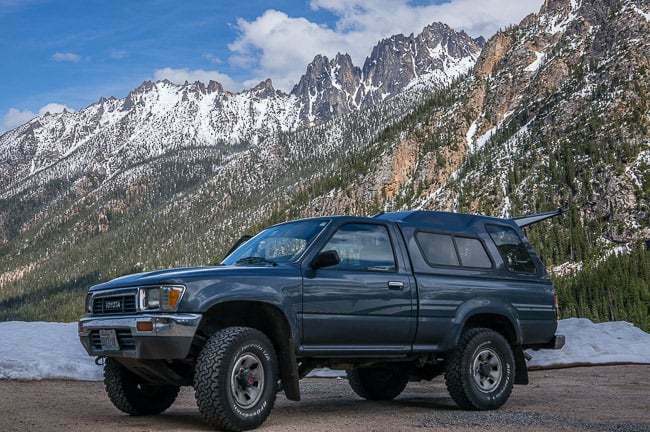 Lastly, what’s your overall opinion on me fully living in a truck? I like being challenged and feel like I could live anywhere in any situation. To many people, this could be a weird endeavor, but it’s badass to me. I’d love your insights and opinions. Thank you! Hey Six, thanks for the comment. 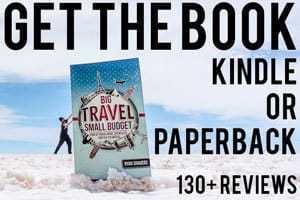 I think it’s awesome that you are looking at using truck camping to reduce your expenses and keep the adventurous lifestyle alive. Heat and humidity does wear on you… But the good news is that you will acclimate to it eventually, and what was once unbearable hot will be okay, and what was once “really warm” may actually start to feel “cold”. In terms of your actual question, I have seen rigs that utilized basically a window AC unit that was rigged into a sheet of plywood that sits across where the tailgate would close. There are also small dehumidifiers which I would be more inclined to try (paired with a small fan). But for either you would need a fairly robust dual battery setup or somewhere you can park and plugin to the electricity grid. 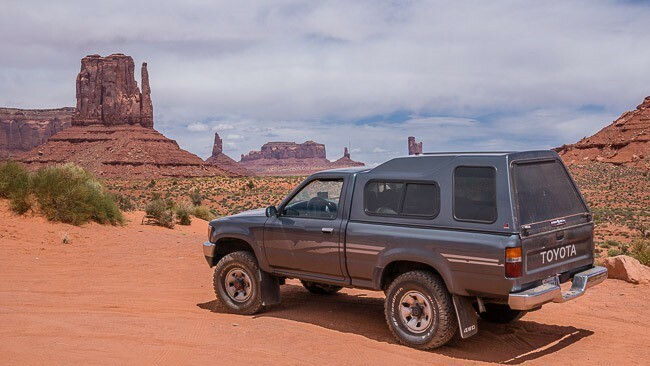 In terms of cheap trucks, I’m partial to old Toyota trucks if you couldn’t tell. Hah. Somebody reached out to me recently in Atlanta that was selling their truck (basically exactly like mine but an extended cab and V6) that he was selling for for $3,000. Not sure what your budget is. 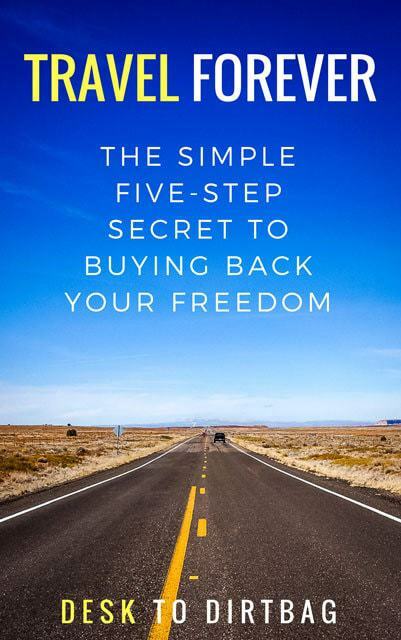 In terms of full time living in a truck — it’s cool, although I’ve never done it full time in a city while working, that would be a different experience, but I’ve seen a number of people doing it to save money. What would be nice is if you could track down some reliable places where you will be able to park every night — or otherwise get some idea of how the situation is in Tampa. Best of luck and feel free to reach out down the road with other Q’s. I have Toyota Tundra double cab/ 6.5 bed. I am trying to find dimensions of the 122 – my garage has a 93″ height clearance. Dealer trying to contact Leer about it but thought maybe one of you might have an idea (i’m sure some depends on application/tires etc.). I am also good with considering the 180 too! It makes sense that you would want to consider side windows when choosing a truck canopy. My wife and I are planning on going camping, but it looks like it may be a very rainy summer. I definitely think that we should get a truck cap that could keep all of our equipment dry. I just bought a Leer 100R for my truck. I have a flareside bed, so Leer is the only one that made them for my truck. I’m taking a trip this weekend to test out the camper shell, but I’m still building out the inside. It’s supposed to be 10 degrees outside so hopefully I can stay warm. Any ideas for keeping warm on the inside? I know most electric heaters are high energy consumption and I’m apprehensive about using a gas heater in such a small area. Thanks! Just got a topper with side window/doors with screen sliders. Best thing ever, especially in a F150 where the bed is bigger. We arrange our coolers and food storage along one side for easy access. Almost totally eliminates having to crawl into the bed to get stuff near the front of the cab. We also have bikes on the back a lot of the time so access through the back hatch is not as easy. Never thought of the carpeted headliner?! Is that too tall to go through a automatic car wash? I live where it’s snows heavy and salt is on the roads. I haven’t run into a problem. I think it’s fine for the majority of them. I can still get into most parking garages and such as well. My biggest concern is air conditioning in hot environments….what to do?? If I am going to purchase a car or truck, I make sure that the shell of the truck is big enough to fit me in there without having to adjust too much. I have been in some cars where I hit my head on the top of the car. It isn’t very fun, especially in a truck. Comfort is a really big thing in my eyes. You raise an important point. The bed should be a decent size for you, and yeah, headroom is super important!